The school is the first and only Vincentian institution to have attended the Penn Relays. However, within recent times, questions have been raised about their participation without visible results. Harry confirmed that there are enquiries for some of his athletes to enter a US college. “Right now, a few of the students are being lined up for possible scholarships at a college,â he disclosed. Harry noted that several individuals here and in the diaspora have a loyalty to the school and continuously help fund their participation. “Organisations in the USA have special fund-raising to help us to attend the Penn Relays; some here only do so for the same purpose,â Harry said. His explanation comes in wake of opposition by some persons to central government giving assistance to the school to fund the schoolâs trips since 2011. Reports are that this year, the school only received $10 000 from the Government through the National Lotteries Authority. Many Vincentians in the United States have made it an annual affair since 2011, putting on bus rides mainly from New York, to see their athletes from St Vincent and the Grenadines compete. Having opened the doors, Harry is calling for more Vincentian schools to take up the challenge and venture out to the Penn Relays. “I would like to see more of our schools take up the challenge and attend the Penn Relays… It is more than just the relays, as it is an experience, as it opens the athletesâ eyes to a higher level of competition … It is a whole different experience,â Harry advised. 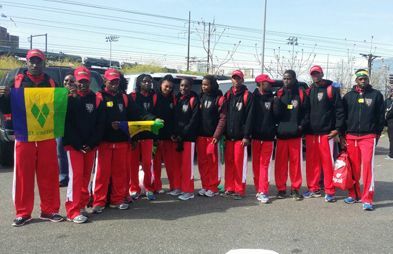 The Thomas Saunders Secondary participated in the 4×100 and 4×400 metres for both males and females. The quartet of Rogike Thorpe, Kailon Kirby, Neilo Thomas and Erasto Da Silva clocked 44.48 seconds in the male 4x100m, which ranked them 100th out of 580 participants. The same four in the 4×400, returned a time of 3 minutes 25.72 seconds, which put them 79th of 552. The females â Kerina Hooper, Rownesha Spencer, Jasmine Robertson, and Zamesha Myle â registered four minutes 08.15 seconds in the 4x400m, gaining a ranking of 93rd out of 636 quartets. Hooper, along with Oleisha Ryan, Mekelia Slater, and Cheslyn Simper clocked 51.20 seconds in the 4 x 100m, which saw them earn 53rd, ranked from a total of 376 participants. “It was a good show for us despite it was really, really cold,â Harry stated. He said that he and his management team are already looking to next yearâs event, and have commenced planning. Apart from Harry, making the journey to Philadelphia, Pennsylvania, April 23 to 25, were athletes Zemron Chance and Mickhail Legair, assistant coach Ronique Dowers, manager/chaperone Dwana Balcombe and teacher Farrah Bailey.